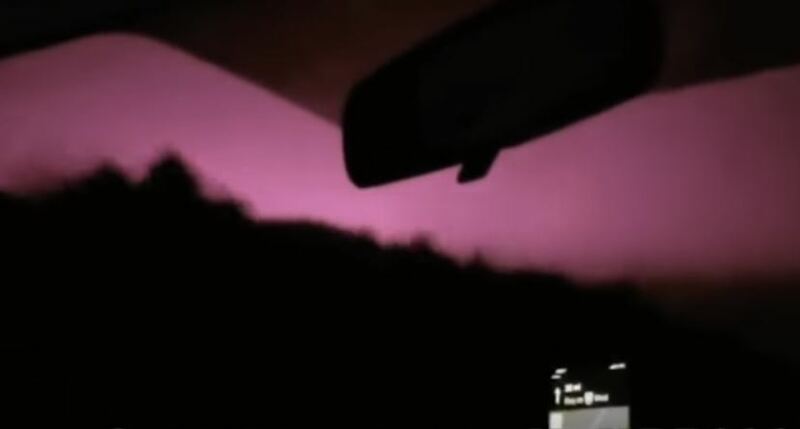 An unusual and strange purple glow is increasingly being reported illuminating the sky over different places in the United States. 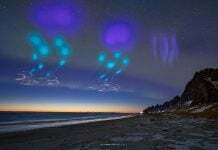 But the reason behind thise weird sky phenomnon remains unclear. October 13, 2018 – Location: River Kuyahoga, Ohio – I went outside to make sure that it was not the light of the lamp and noticed that the purple sky was only in one place. October 13, 2018 – Location: Cleveland, Ohio -I was heading to a gas station when I saw this strange light in the sky that I had never seen before. October 27, 2018 – Location: Cleveland, Ohio. I keep seeing these weird purple lights, what is it? 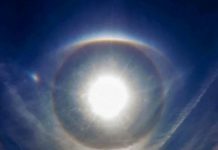 October 31, 2018 – Location Bellevue, WA – Witness: A strange glow in recent days illuminates the sky and it is not a searchlight, I do not understand what it is. November 4, 2018 – Location: Wisconsin -I have never seen anything like it. What is that purple light in the sky? Here my articles about purple skies over Florida and Ohio during Hurricane Michael, over Santiago de Chile and over California. I have heard airbourne lithium produces a similar effect. it’s due to the cosmic rays hitting earth due to the waning magnetosphere, this due to the grand solar minimum. check out oppenheimer ranch project on youtube. 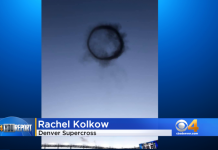 But why the chemtrails to hide this in the sky? I can relate to that possibility but u have to watch how these clouds are moving. I know sounds weird but they look guided. I have the 1st page of a pdf that mentions how to control scattered clouds using coded metasurfaces. It could be from people gifting the environment with orgonite to counter the effects of geo-engineering. Ionizing the atmosphere is a good thing. Paradise, California has been surrounded by wildfire, now. Many structures were burnt down just like Santa Rosa Fire. Hi, right now, wildfire is revenging Paradise, California. The information below said that Walgreen, has 70 people, is surrounded by fire. Even a hospital was burnt down. All the people in Paradise had to evacuate. About 200 people are trapped in the burning area. The power company turned off the power in the area. Cellphone service and electricity is down. Within an hour, the fire expanded from 1000 acre to more than 10,000. Fire fighters are NOT extinguishing all the structural fire because they want to evacuate people first. Many structures were burnt down. Now fire fighters are defending along Skyway (street name). Live Wildfire coverage of the #CampFire in Butte Co CA. This wildfire is new, today. I cannot find Youtube video for this fire except for a video below. 11-08-18 Paradise, Ca-New California Wildfire Creating Apocalyptic skies..
More than 200 people are trapped in Kmart in Paradise, California during this FIRE! A hospital roof is burning. The building next to the hospital was completely burnt down. Walgreen with 70 people is surrounded by FIRE. Many structures in city were burnt down! Skyway that is the main street of Paradise has FIRE burning. Feather River Hospital with 40~50 people are trapped by FIRE. One of the hospital buildings (next to the main hospital building) has been completely burnt down. There are still many people in Butte College remaining. They have to evacuate before FIRE consumes them. On Skyway (main road in Paradise), there are many burning cars, blocking the road where Fire Trucks have to reach the city. There is a long line of burning cars on Skyway. In the FIRE affected area, 911 calling center is overwhelmed. If you are trapped in FIRE area, you have to dial 530-538-7911 instead of 911. 150 people are trapped in FIRE around the gas station at the intersection of Skyway and Clark Rd in Paradise, CA. Skyway between Clark Rd and Wagstaff Rd has heavy fire. Many cars on the roads are on FIRE. Between 3~4 O’clock in California is the witch hour, the condition of gasoline over the FIRE. That witch hour is coming soon. Now, officially, FIRE spread 0 acre at 6 AM to 18,000 acres, now. Fire trucks are running out of water and gas! They are going to use bulldozers to get rid of burning cars on Skyway so that emergency cars and fire trucks can get into Paradise. There is a long line of burning cars on Skyway. Fire fighters cannot use hydrant to get water they need because PG&E has already shut down the electricity for a while city. Hydrant is operated by electricity, pumping out water. Without electricity, NO water from hydrants. Cal Fire suspects PG&E started this FIRE. Right now, wind gust is 50 mph!!! Probably a whole city has been engulfed by FIRE. I cannot find any news about this FIRE on CNN. Are they hiding? I am sure that this FIRE is very special for Government. PG&E has started this FIRE, ha? Walgreens, Feather river hospital, Safeway, McDonald’s are gone. Second body has been found. At least 2 fatality. This is from a school book? sounds like that. It is is right now as we speak Houston TX. I have my theories. It’s Prince, putting on his last big light show before the music starts, as the End of the World begins! Jimmy Hendrix prophesied it with his Purple Haze song. So did Prince with his 1999 song. Look closely those pictures. Again! Just like some other so called “Wildfires” are not really wildfires. Can you notice? Only buildings and cars were burnt down, but all the dry pines are intact! In California, they have not gotten significant rain for months. Those dry pines should be a good fuel for fires. But look! They are completely intact! What this means? This means buildings and all other artificial objects were targeted to be burnt down. Whom should be blamed? Fire officials are saying PG&E started this fire in Paradise. I do not know any news has reported this? PG&E poison contamination of city water class-action lawsuit was a famous one that has become a movie, Erin Brockovich, starring Julia Roberts. I hope this time, too, PG&E gets a class-action lawsuit from the people of California! Some news reported most of people in Paradise could evacuate outside of Paradise. That problem is how many people left out in the burning city. It was really hard to evacuate because there were only 3 roads toward outside of Paradise, and 2 of them were closed due to long line of burning cars on the roads. Overnight, the fire burned to the southwest toward the city of Chico and Butte Creek Canyon and south toward Highway 99 and 149. The fire has crossed Highway 70 near Pulga and will continue to burn to the east and southeast toward Yankee Hill. It looks like FIRE is getting closer to Chico, California. All the schools in that area are going to be all closed for next week. Many evacuees from Paradise are camping out in the parking lot of Walmart in Chico, California. Pictures of some of missing people including Reptilians and hybrids during this FIRE. Now, Camp Fire around Paradise expanded to 70,000 acres! Yesterday evening, it was 20,000 acres. Only 5% containment, and still spreading. There is another FIRE around north of Los Angeles, Thousand Oaks FIRE. At the same day? some shooting happened in a bar in Thousand Oaks, and news reported 12 people were killed. I believe most of shooting incidences in news are all FAKE. But Fake Drama or not, the same location developed FIRE at the same time is really strange! Oh my GOD! A whole Earth is wobbling. Look at the huge house of rich Reptilian burnt down by GOD, just like GOD burnt cities of sodom and gomorrah.